Unai Emery is ready to pair Pierre-Emerick Aubameyang and Alexandre Lacazette together in attack to ignite his Arsenal reign. France international Lacazette arrived at Emirates Stadium from Lyon for a club-record fee believed to be in the region of £52million last year. He lost that status and his place as the Gunners' first-choice striker when Aubameyang came in from Borussia Dortmund in January before missing out on a spot in Les Bleus' triumphant World Cup squad. Emery deployed the duo in tandem during pre-season and Lacazette's introduction alongside Aubameyang sparked Arsenal's most encouraging period of the 2-0 defeat to Premier League champions Manchester City on the opening weekend. 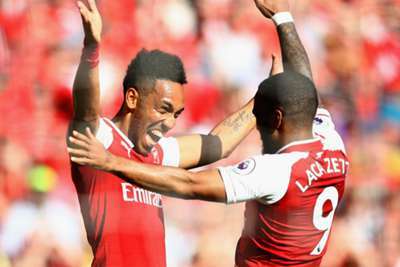 “The possibility to play Aubameyang and Lacazette is okay because we tried that in pre-season," Emery told reporters ahead of the keenly anticipated London derby against Chelsea at Stamford Bridge. "Each match is different, each match is a different possibility. Against Manchester City, the last 25, 30 minutes they played together. "For me it's about finding the good balance for all that we want in attacking moments and defensive moments. "I want to look at every player together, how to get Aubameyang and Lacazette scoring more goals, whether as one or together." Arsenal last lost their first two games of the season in the inaugural Premier League campaign of 1992-93. Speaking to ESPN this week, Aubameyang recognised his link-up with Lacazette as a potential route to success. "We really get on well," he said. "There is a spark between us when we are both on the pitch together. "We look for each other, we saw it against City when he came on. I don't mind playing on the left if Laca is in the centre. We both want to do our best for the team."